But things are coming together. Scaffolding goes up on Tuesday/Wednesday. 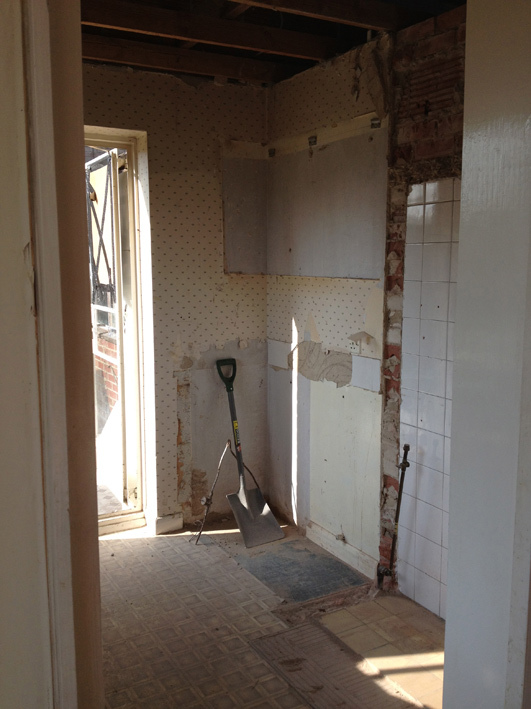 We hope to strip the roof tiles and temporarily shore-up the existing felt immediately after that. Unloading the roof of the heavy concrete tiles will allow the structural changes to be made safely (don't want to be cutting any timbers out while it's under load). 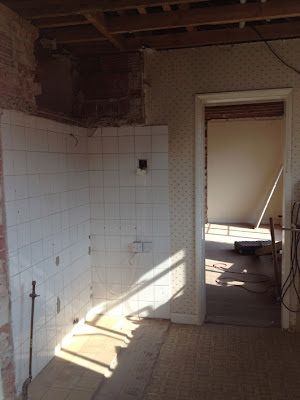 After Easter, hopefully the builders will come in and start the structural changes. This consists of a chunky new laminated timber (glulam) ridge beam, a new and even chunkier glulam purlin, and a series of smaller glulams at ceiling level which will hold supports for the main beams. The two big beams are very heavy which is another reason for using the builders - they have the kit and the bodies to be able to manhandle these around and into place. The guy whose building firm it is tried to persuade me to just removed the roof and start again. I can see his point - this would have been easier - but my point is that this would have trashed a load of timbers that are still doing a perfectly good job 47 odd years after being put there, so would be unnecessarily wasteful. Other things going on at the moment are negotiations with the structural engineer and the building inspector about various elements, especially the foundations. Rob, the structural engineer (from Structural Solutions) is very helpful and has pretty much agreed the foundation design we want, which is cement/concrete free (cement is one of the most polluting materials - for each 1kg of cement produced 1.25kg of C02 are released, and alone it accounts for around 10% of global C02 emissions - http://www.rammed-earth.info/project/45/). This design was developed by Structural Solutions with Amazonails (now split into two strawbale consultancies, http://www.strawbuild.org/ and http://strawworks.co.uk/) and proven in a number of projects. This precedent means the building inspector should approve it. The other area of building inspector negotiations involves the masonry stove we hope to build. The simplest method of approving solid-fuel stoves is to use a stove and an installer that is HETAS registered, which more-or-less guarantees it will pass building control. This is not a legal requirement though; other stoves can be installed provided they can be shown to conform to the building regulations. 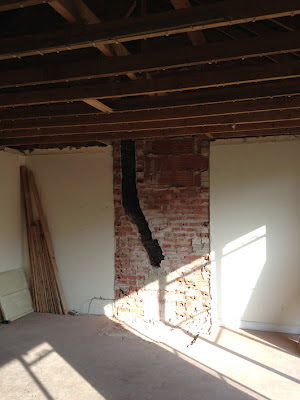 Once reminded of this the building inspector has actually been quite helpful and seems open to the idea. He will need detailed designs and construction info in order to approve it. I think this test document has helped with that: http://finskemasseovne.dk/Rapport/300-ELAB-1562-EN-samlet_engelsk.pdf. It details a series of tests on fuel consumption, emissions and safety of the type of stove we hope to have built, including the crucial temperature of adjacent surfaces information which is critical (control of burns and fire risk essentially). It shows a combustion efficiency of 88% which is brilliant, and the adjacent surfaces temperatures are all well below the allowable limits (masonry stoves store heat in the mass of bricks and release it slowly - you get a longer lasting heat and massively reduced risk of burns). Likewise in the old kitchen/utility-room-to-be. 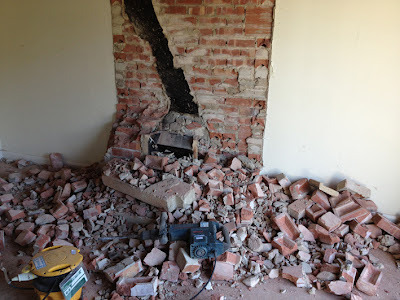 Drilling through/breaking up the concrete slab that formed the top of the hearth/base of the chimney breast was immensely satisfying. As was swinging a sledgehammer straight through the left hand wall of chimney breast. More light, more space. Increasingly getting a feel for how it should end up looking.